February 29, 2016 – I’ll start posting wildflower updates here as the season progresses. I spotted my first bluebonnet bloom on our land yesterday. I’ve never seen one show up in February, so this is a first. I’m thinking now that our bluebonnets will arrive earlier than usual. I’ve read reports there are some patches of blue along the road near Burnet, Texas, and I’ve seen some scattered fields of phlox in areas south of the Hill Country near San Antonio. With the recent rain, it seems to have started the season. No bluebonnet images in this post, but they’ll be here soon! Posted in Bluebonnets, Texas Hill Country, Texas Wildflowers and tagged bluebonnet report, bluebonnets, texas wildflower report, Texas wildflowers on February 28, 2016 by Rob Greebon. About 25 minutes before sunrise, if high clouds linger across the sky and an unfettered path for sunlight appears in the east, colors of red, pink, orange and blue can fill the sky. And just after that is about a 10 to 15 minute period when the once vibrant sky’s colors fade and it appears almost washed out until the sun finally rises over the horizon. It is during this fleeting time of quiet that my mind is set free from my daily obligations that often clutter my thoughts. Sometimes you just get lucky. 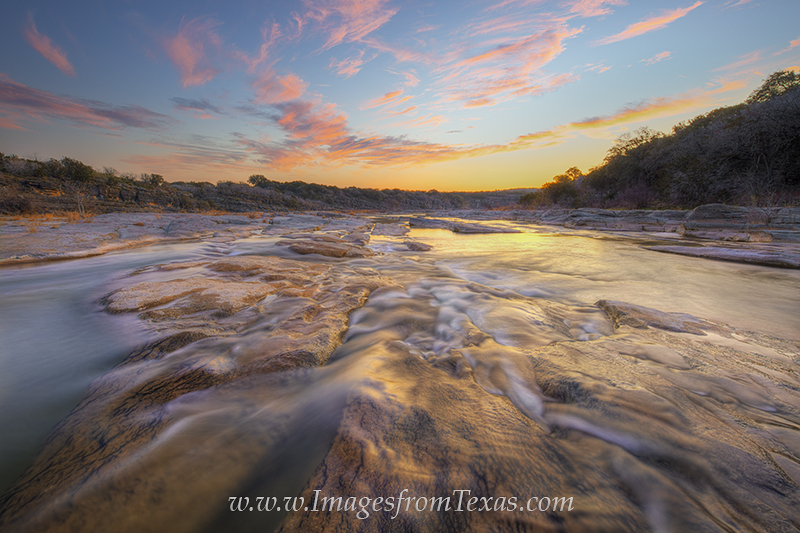 On this February morning along the Pedernales River in the Texas Hill Country, the light was magical and lit up the flowing water a little before sunrise. I had to wade through the cold water to reach this point, but it was well worth it. At one point, I just had to step back and take it all in… one of the most beautiful mornings I’ve experienced in many years of working at photography. I didn’t notice my feet were absolutely freezing until the walk back along the trail! Sometimes you just get lucky. On this February morning along the Pedernales River in the Texas Hill Country, the light was magical and lit up the flowing water a little before sunrise. I had to wade through the cold water to reach this point, but it was well worth it. At one point, I just had to step back and take it all in… one of the most beautiful mornings I’ve experienced in many years of working at photography. I didn’t notice my feet were absolutely freezing until the walk back along the trail! Moments like this are special. In much of my adult life some of my fondest memories are times spent outdoors. Looking back at the days of my youth, I would spent all the daylight hours playing outside – searching for craw-dads, playing sports, and walking creekbeds. I never noticed how hot it got in Texas in the summer. After college in Austin, I worked a summer job in a Colorado mountain town, escaping every afternoon with my best friends to explore rivers and fly fish high, remote streams in search of cutthroat and rainbow trout. One of those friends is no longer around, though I do miss him. Another has remained and we still spend some time each summer hiking our own bucket list of Rocky peaks, though other duties – my work and family responsibilities in Texas – have cut down that free time considerably. So in mornings like this when my photographic treks find me alone along these scenic rivers that wind through the Texas Hill Country – in between the early morning colors and the sunrise – the sounds of water bring back memories of my life’s time. The words and conversations of those bygone days – and those times with friends – have faded. But sometimes I can hear the laughter. With a soft gurgling the swirls of the river flow around and over the rocks, and in those sounds I can almost follow behind the laughter and slide into the past. And just as quickly the light, the colors, and the faint emotions slip past my sitting spot and flow with the waters downstream and disappear. 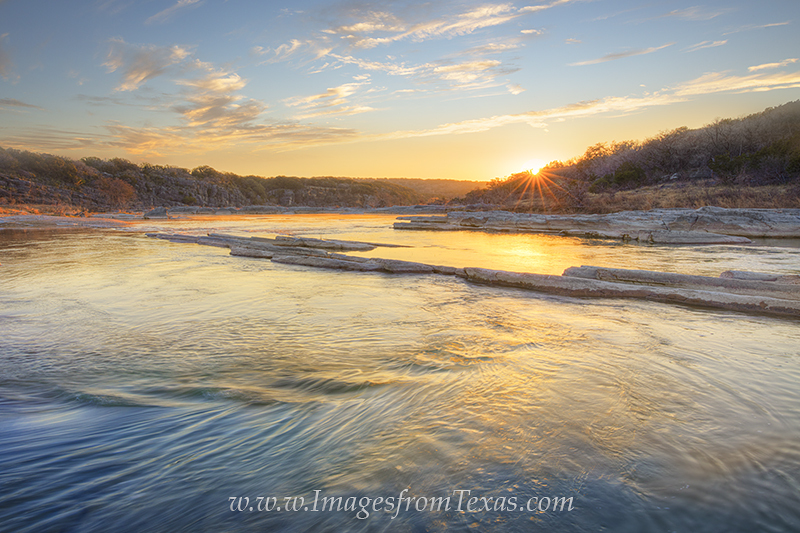 The waters of the Pedernales River turned gold and orange on this crisp February morning in the Texas Hill Country. The sun had just peeked over the distant ridge, finally bringing warmth to a beautiful beginning of the day. I think there must have been some moisture in the air, as well, because the area seemed to take on a golden hue right after the sun made an appearance. In those quickly passing moments that seem to last both a few seconds and an hour, I’m reminded of the precious moments we share. But the river brings me round again and soon the brilliant glow on the horizon gives way to a light so bright I can’t look at it directly. After seven clicks of my camera’s shutter and with sunlight spreading across the canyon floor, I know my time in this moment is done and it is time to return home. This beautiful morning I’ll remember, though, and I’ve still a long way to go. Posted in Pedernales Falls State Park, Texas Hill Country, Texas Landscape Images and tagged Texas, texas hill country images, texas images, texas landscapes, texas prints on February 20, 2016 by Rob Greebon. It has been 40 days since the Texas Hill Country enjoyed any discernible rain. This past October, November, and December, the rains were plentiful. Many area lakes were again above average after years of drought. And the wildflowers season of 2016 looked very promising. Right now on my small piece of land, bluebonnet rosettes are everywhere. They’ve been that way for a few months – sitting and waiting for spring to arrive. But they also need water. To quote one of our central Texas weathermen, “for us, El Nino has been a real dud so far.” From a photographer’s perspective, this statement is true in many ways. Don’t lose hope, though, for a prominent and colorful season Texas wildflowers. The long range forecast by the Climate Prediction Center still shows the hill country with “above average” rainfall predicted for the next several months, especially in March, April, and May. Looking at the long range forecasts on accuweather and weather underground, we begin to see rain show up again about 9 days. Let’s hope this holds up. In the meantime, I’ll spend some mornings poking around downtown Austin, maybe spend some time near my home in the hill country, or out flying my drone and taking aerial images from a bird’s eye view. I also have a trip planned for Big Bend – and I’m hoping the bluebonnets will be nice out there. But really, I’m looking forward to (and hoping for) a very colorful spring season not just for bluebonnets, but for the Indian paintbrush, firewheels, coreopsis, and even the prickly pear blooms that appear in late May and early June. 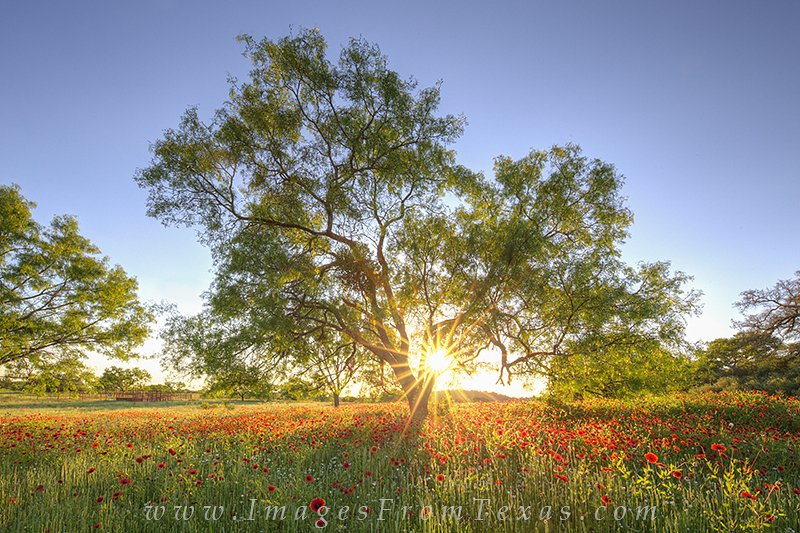 Across a field of red Texas wildflowers, the last sulight of the evening streams through the still trees. This patch of firewheels was found just north of Llano in the Texas Hill Country. Between now and then, happy travels, Texas (or wherever your life leads you)! Posted in Texas Hill Country, Texas Wildflowers and tagged bluebeonnets, bluebonnet photos, bluebonnet prints, texas hill country, texas wildflower images, texas wildflower photos, texas wildflower prints, Texas wildflowers on February 12, 2016 February 13, 2016 by Rob Greebon.